The achilles tendon is located at the back of your ankle and attaches your calf muscle to your heel bone. The calf consists of two muscles called the gastrocnemius and soleus muscles are the primary muscle of pointing the foot. Achilles tendonitis describes when that band of tissue gets inflamed and irritated from excessive use. The pain is located at the back of the heel and it will feel better after a good warm-up and worse with jumping, relevés, and pointe work. 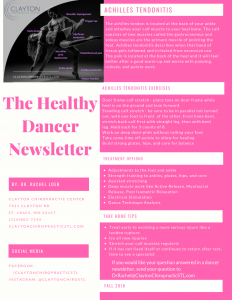 Standing calf stretch – be sure to be in parallel not turned out, with one foot in front of the other, front knee bent, stretch back calf first with straight leg, then with bent leg. Hold each for 3 counts of 8. These have been mailed out. If you would like one, please email us or download a copy here. 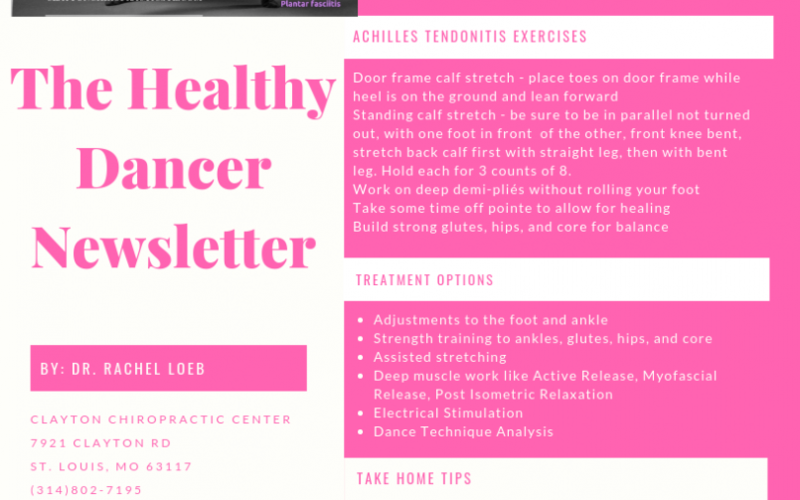 Achilles Tendonitis PDF.